Home > Wills, Legacies & Bequests > How Do I Leave Money to a Charity in My Will? Many people want to leave money to charities after their death. This is an effective way of ensuring that the causes close to your heart can benefit from your estate. As with any aspect of will-writing, legacies and bequests must be dealt with in a legally valid manner. So how should you go about leaving money to a charity in your will? To begin with, you should understand that there are several different types of legacy. The three most common are pecuniary, specific, and residuary. A pecuniary legacy involves you leaving a specific amount to a charity, determined at the time of the writing of the will. A specific legacy means that a specific asset is left to the charity. A residuary legacy means that you leave a proportion of the ‘residue’ of your estate to a charity – that is, what is left after other liabilities such as debts have been paid off. The value of a pecuniary legacy generally falls, as it is eaten away at by inflation between the time at which the will is written and the time at which the charity receives the gift. Many charities prefer a residuary legacy as its value will be linked to the value of the estate as a whole. 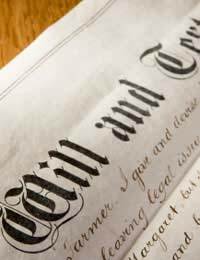 A will is an important legal document, and one that must abide by certain rules and conventions if it is to be valid. The importance of this cannot be overstated; wills are often challenged, for example by creditors, and it is therefore vital that it is watertight. You may well wish to seek the help of a solicitor or professional will writing service to help you ensure that the document is prepared properly. They will also be able to help you determine which type of legacy is the most appropriate. It is worth noting that some charities offer free will-writing services for individuals who intend to leave them a gift. While potentially useful, this practice has been widely criticised as appearing opportunistic. You may wish to think carefully before using a charity’s own will-writing service. It is vital that you give full details of the charities you wish to leave money or assets to, particularly if they are not well known. You should include the full name of the charity, its registered address, and its registered charity number. It is also important that you include a clause making clear that, if the charity changes its name or is amalgamated with another charity between the writing of the will and your death, your gift should still be passed on to your intended organisation. A solicitor can help you to insert this clause. In some circumstances, you may not be entirely sure which charity (or charities) you wish to leave your money to. Indeed, your choice may depend on future events that you might not be around to see. In these cases, you might consider establishing a discretionary trust. Broadly speaking, a discretionary trust allows you to set aside money to be distributed by trustees. The trustees have significant discretion when it comes to who gets the money, and how much they get – hence the name. Again, you should speak to a solicitor to help you set up a discretionary trust, and to determine whether or not this is the right choice for you. Although thousands of people leave money to charities in their will every year, it is still important to remember that this is a complex procedure that must be completed according to the law. You should therefore seek independent advice if you are in any doubt.